A computer network is indispensable for realizing the use of telemedicine. Recently, experiments to provide telemedicine to residents in remote places over a broadband Internet access have been reported. However, if a disaster were to occur with devastation over a wide mountainous area, and telephones and Internet access were to become unavailable, the provision of telemedicine for injured residents in this area becomes difficult. 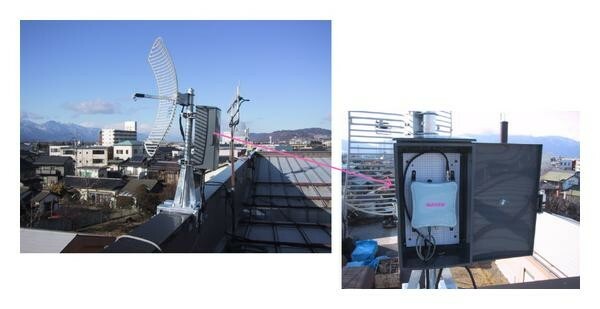 To solve this problem, we have developed 2.4 GHz wireless LAN units with the longest coverage in Japan to date, of 30 km plus at 54 Mbps which complies with the IEEE802.11 g standard and the Japanese radio regulations to re-establish communications temporally between disaster devastated areas and hospitals, and so on. We tested them in the disaster prevention drill with the regional fire bureau and concluded that wireless LAN units we developed can transfer high-quality video images and sound good enough for use in telemedicine. Providing prompt and efficient post disaster measures, the opportunity to share and utilize live video images of a devastated area has become very important for disaster-related organizations. Emergency services, such as fire, search and rescue, hospitals, and international help organizations will also need to provide much needed assistance to help victims in a catastrophe. They will also need to use an affordable and reliable communication system to help people in remote and devastated areas. In the aftermath of a disaster, breakdowns in communication networks usually occur. Examples would be the affected areas in the 2004 tsunami in the Indian Ocean, and the 2005 Hurricane Katrina incident in the United States. Both incidents highlight the need for a communication system that is easy to set up, operate, and that is also inexpensive. After these disasters, it became apparent that the failure in the communication networks greatly contributed to the high number of casualties, injuries, and sickness in the affected areas. The importance of providing telemedicine in Japan is starting to be realized, as this country is fast becoming an aged society. By 2050, it is predicted that more than 40% of Japan's population will be over the retirement age of 60. Providing telemedicine with high-quality video conferencing using broadband networks, mainly used for Internet access, has been studied, as fiber-optic networks have spread and become available in Japan . To provide telemedicine to areas where no broadband network service is provided or where any type of telecommunication becomes unavailable, the only infrastructure that is expected to be accessible is through a satellite network. One reason is because cellular phones are eliminated from service for two reasons. The first is that towers for base stations of the cellular phone systems have collapsed and electric power outage occurs. Or the system is overloaded with nonemergency telephone traffic from outside the affected areas and thus is shutdown. The use of satellite communication has been proposed and studied to be used for telemedicine and in disasters [2–4]. With the advance of satellite communication equipment, satellite IP network services using very small aperture terminal (VSAT) have become popular in mainly rural areas to access the Internet. And VSAT has been studied for providing telemedicine [5, 6]. To establish temporal network connections especially after a disaster, a hybrid network communication system using VSAT and wireless fidelity (WiFi, IEEE802.11b/g wireless LAN) has been proposed and evaluated [7, 8]. This type of system has already been field-tested and put on the market. However, satellite network connection services by VSAT have three major problems; they are as follows. It provides asymmetrical transmission rates. Even in advanced services using a 1.2 m diameter dish, uplink speed is less than about 2 Mbps, even though downlink speed is up to 60 Mbps. In providing telemedicine, uplink speeds are an important feature since high-quality still or live video images of patients should be transferred to hospitals using uplink communication. These images are necessary to enable doctors to diagnose victims' medical conditions. The second problem is that VSAT equipment is heavy. When a large-scale natural disaster occurs, it may be impossible to take VSAT equipment to some devastated areas, since roads are greatly damaged and all traffic is shut down. The third is that there is at least 1 country where VSAT is not licensed to be used for telemedicine , and there may be more. 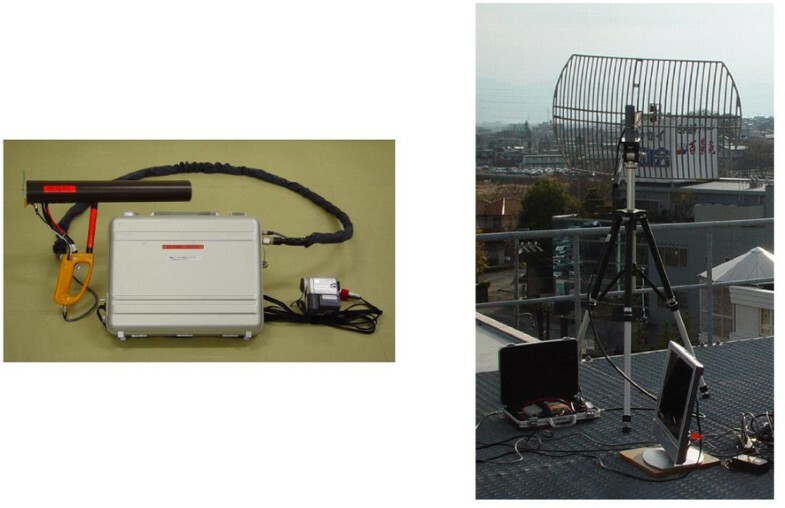 Beside applications of satellite communications in disasters, use of WiFi and Worldwide Interoperability for Microwave Access (WiMAX) has been proposed and studied [10, 11]. It has been assumed that WiMAX can provide broadband wireless access (BWA) up to 50 km between fixed stations and 5–15 km for mobile stations. And it can provide high-transmission rates of up to 70 Mbps [12, 13]. Of course, there is a tradeoff between the distance and transmission rates. WiMAX is now in its early stage of deployment and is not widely implemented. Most evaluations have been conducted on an experimental basis . As WiMAX is a metropolitan area network (MAN) technology, its deployment has started in urban areas thus deployment in rural areas has a high possibility of being delayed. In most countries, WiMAX uses licensed spectrum in 2.5 GHz band and/or 3.5 GHz band. WiMAX infrastructures will be very similar to cellular phones' infrastructures. WiMAX-base stations are to be mounted on towers and rooftops of buildings. All base stations are connected to each other with wired high-speed backhaul networks. As a result, large-scale disasters cause significant damages to WiMAX infrastructure and it would be expected that big troubles like cellular phone systems are sustained. On the other hand, WiFi or IEEE802.11b/g wireless LAN is said to have shorter coverage of up to some 100 m and it can provide transmission rates of up to 54 Mbps. Using WiFi units in disaster areas, establishing makeshift broadband networks has also been studied. Researches on setting up mesh networks or ad hoc networks with WiFi units in areas struck by disaster and evaluation of its networks have been conducted [15–17]. WiFi has advantages over satellite and WiMAX in the following areas. Using commercial off-the-shelf WiFi units, high-speed network almost equivalent to WiMAX can be established at lower costs. WiFi units are available all over the world with the same unlicensed spectrum. Therefore, fire, hospitals, and search and rescue teams from overseas that usually come with limited communication capability can communicate to each other with a high-speed transmission capability. In Japan, the central government, local governments, fire offices, and hospitals use different licensed spectrums and thus are not permitted to communicate to each other. WiFi can remove this restriction. A shortcoming of WiFi is the coverage. Most researches were conducted in less than 300 m coverage [18, 19]. To solve this problem and enable WiFi to be used in a disaster, we developed long-range and high-speed wireless LAN units to establish makeshift but high-speed wireless LAN networks. These networks would establish communication between devastated areas and local authorities. The networks are easy to be built and anyone can use without any radio-related licenses. Our networks would also be practical for use in other countries with limited resources and manpower to establish temporary emergency communications. To demonstrate the capability of this unit, we helped organizing an earthquake drill conducted with a regional fire bureau in Japan. We established a communication network using these units which gave a video and audio link between two points at a distance of over 40 km. This link was between a village located in a valley surrounded by tall mountains and a hospital in an urban area located in a different valley. From this emergency drill, our experiments succeeded in being the first of its kind to transmit video and audio in this way. We also establish a record for the greatest distance that information was transmitted in Japan. We believe this system can be used over a greater distance if it were operational in nonmountainous terrain. This paper is organized as follows. Section 2 describes the deinformation velopment of long-range and high-speed wireless LAN units. Section 3 describes an experiment on a telemedicine network in an emergency with wireless LAN units. Section 4 describes experiment results and Section 5 presents discussions. Finally, Section 6 draws conclusions. Most of the information provided in this paper will center on Japan, because most of our research and experiments were undertaken in that country. First of all, we introduce the long-range and high-speed wireless LAN unit we developed to establish a temporary emergency link. This type of communication system enables information transfer between mountain areas and the disaster-related organizations such as hospitals and local authorities. Currently in Japan, under the domestic radio regulations, wireless LAN is the only radio equipment with a high-transmission rate permitted to be used without any radio-related licenses for the operation. This allows local residents, firefighters, paramedics, doctors, nurses, and any foreign relief agencies to operate this setup without getting any radio-related licenses. available use of all software (video-conferencing software, etc.) and equipment (video cameras and hookup wires, e.g.) for use with personal computers. So far, we developed IEEE802.11b-complied-wireless LAN units. These units have a capability of coverage of about 50 km at the transmission rate of 11 Mbps. By using these units, we have succeeded in giving network communication links between mountain huts and hospitals at the foot of these mountain areas to provide telemedicine to mountain climbers for more than 3 years [20–22]. These mountain huts are located in the Japan Alps at an altitude of 3000 m or thereabout, 250 km west of Tokyo. The Japan Alps is an area where no broadband network service was available, although more than 250 000 climbers from all over the world visit this area in summer season alone. As high definition, TV broadcasting recently has become popular in Japan, demands for video transmission with higher picture quality and multiple video images for use in telemedicine have increased. The IEEE802.11b-complied-wireless LAN does not have enough capability to transfer higher-quality video. To meet these demands, IEEE802.11g-complied-wireless LAN is promising, as this type of wireless LAN has a faster transmission rate than IEEE802.11b-complied units. However, since commercially available wireless LAN units for 2.4 GHz band in Japan are designed to be used indoors. Their coverage is usually for a very short range of about 3 km when trying to operate them with a high-gain antenna at a speed of 54 Mbps. As a result, it is almost impossible to link between mountain areas and urban areas where the local governments and hospitals are usually located using this type of arrangement. Long-range wireless LAN units we have developed, which comply with the IEEE802.11g standard and Japanese radio regulations, can cover a distance of up to 30 km at a transmission rate of 54 Mbps. 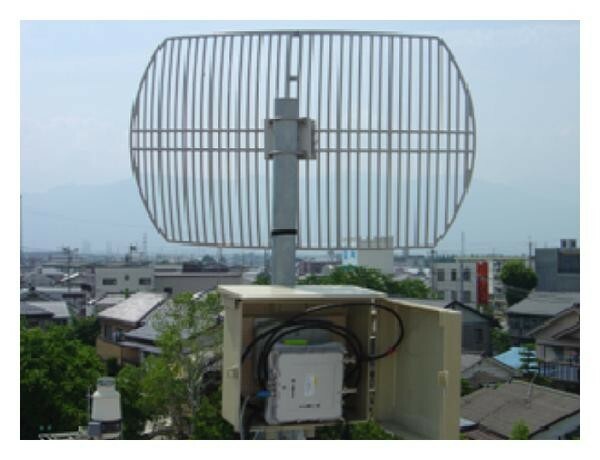 Under current Japanese radio regulations for 2.4 GHz band wireless LAN (IEEE802.11b/g), a radiation power of 10 mW/MHz with a 12.14 dBi antenna is allowed under the condition that the half-power beamwidth of an antenna is less than 30 degrees. This indicates that the maximum equivalent isotropically radiated power (EIRP) per MHz should be 22.14 dBm/MHz. Figure 1(a) shows this maximum EIRP. Output power and antenna gain: (a) current Japanese regulation for EIRP, (b) an attenuator used with a higher gain antenna. To use an antenna with a higher gain, we have to reduce to the maximum EIRP to 22.14 dBm/MHz. An attenuator is inserted between the antenna and RF switch in almost all cases to meet this regulation. As shown in Figure 1(b), to use an antenna with a gain of 22.14 dBi, a 10 dB attenuator is inserted. As an antenna with higher gain has a narrower half beamwidth, this method has the benefit of reducing interferences from nearby wireless LAN units. However, it sacrifices the reception sensitivity; as a result, this method gives a slightly longer coverage. Our method to extend the coverage does not use this attenuator. Thus, this method can transfer signals received by an antenna to a low-noise amplifier with minimum losses. As an attenuator is not used, the output power should be reduced to 1 mW/MHz as shown in Figure 2. However, this method has the following problems. Need to control the power amplifier to output very low-level signals to keep stable. Need to reduce the leakage radiation of a carrier signal from an antenna, which is produced by a local oscillator and leaks through the low-noise amplifier to the antenna. We succeeded in solving these problems. And the use of a higher-gain antenna was achieved. In our development, we succeeded to use 26.5 dBi antenna to receive weaker signals under this regulation. Figure 3 shows the wireless LAN unit. Its size is about 20 cm × 20 cm and it weighs about 1.6 kg. Power supply is either 24 VDC or power on ethernet (POE) with 100Base-T and consumes about 10 W on average. This unit can also be operated with small batteries (car batteries) charged by solar cells because of its low power consumption. A portable parabolic antenna with a gain of 24 dBi we used in this experiment with this wireless LAN is about 100 cm × 60 cm and weighs only 3.5 kg. As a result, it is very easy to take these wireless LAN units, antennas, batteries, and so on, to areas devastated by the disaster. 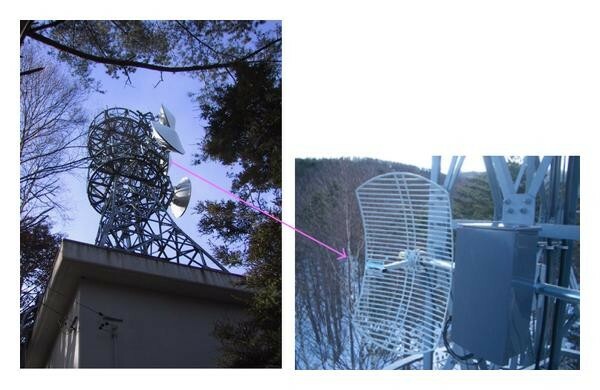 Figure 4 shows a typical installation of this wireless LAN unit and this 24 dBi parabolic antenna to a steal pipe. An installation example of a parabolic antenna and a wireless LAN unit to a steal pipe. These units can be transported by people on foot to establish a temporary wireless communication network capable of a high-speed transmission rate. Because these units are so easy to transport, set up, and operate, they can be installed and operated in virtually any terrain by almost any person, with minimum instruction. Because these units are so manageable, valuable transportation assets are not necessarily needed and can be used where they are more in demand for search and rescue or relief operations. As mentioned in the introduction, this unit is the first of its kind and currently has the longest coverage in Japan to date. One of our experiments was conducted, as a part of an earthquake drill, and it was organized by a regional fire bureau and a village office in Japan. This is reflecting several large-scale earthquakes that have recently occurred in Japan, which killed a lot of people. Nagano Prefecture General Industrial Technology Center (hereafter referred to as NPGITC) and Shinshu University Hospital joined the drill to demonstrate the capability of this wireless LAN. This earthquake drill was planed on the supposition that a strong and large-scale earthquake occurred in a mountainous area and all possible communication networks to this area become unavailable. The purpose of this drill was to take all possible measures in mitigating the damage of the earthquake and to reinforce the rescue measures for victims. It especially focuses on helping paramedics give emergency treatment to victims in remote places using a makeshift but high-speed network. Paramedics guided by doctors, located in hospitals, watching live video images of victims being sent over the wireless LAN network from the devastated areas, administer aid to patients. In the case of Japan, paramedics are limited to the degree that they can treat and give medical help to patients. In some scenarios, paramedics can only perform treatments under a doctor's supervision. Our network allows emergency staff in the field to extend range in giving treatments under a doctor's control. We believe that there may be other countries or regions where emergency workers are limited in the amount of aid that they can deliver without the permission or guidance of a medical doctor. Our equipment may be useful in similar situations allowing paramedics to work with doctors to save more lives. Participants and locations for the aforementioned earthquake drill are as follows. elderly care center "Mizuki" (in Omi village, Nagano Prefecture). Matsumoto Regional Fire Bureau (in Matsumoto City, Nagano). Shinshu University Hospital (in Matsumoto City, Nagano). Nagano Prefecture General Industrial Technology Center (NPGITC) (in Matsumoto City, Nagano). The wireless networks made up of these wireless LAN units are shown in Figure 5. (g) Nagano prefecture Matsumoto branch office in Matsumoto city, Nagano. Nagano prefecture Matsumoto branch office (g); and Matsumoto Regional Fire Bureau (b): 1 km. Forty one kilometers is the longest distance covered in this experiment, between Yakusi Park and Kiyomizu. At each relay station, two wireless LAN units are connected to each other by its Ethernet interface via a switching hub as shown in Figure 6. Connections are simple and very easy to be completed by just about anyone. The entire established network when seen from the viewpoint of the wireless network connection is shown in Figure 7. 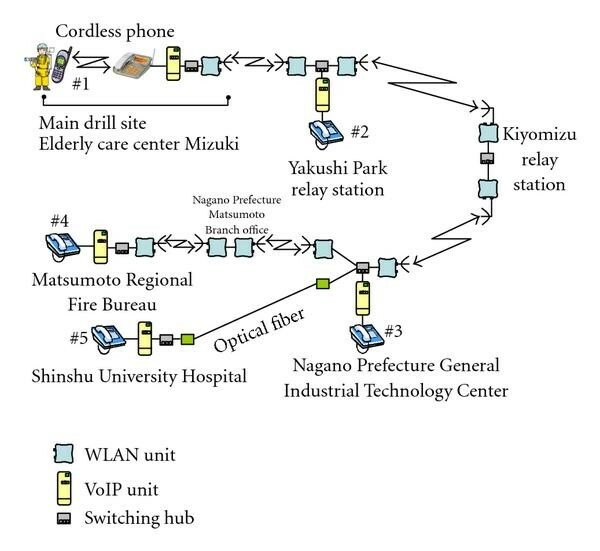 Between NPGITC (d) and Shinshu University Hospital (c) alone, a fiber-optic network with a 100 Mbps transmission rate was used. This optical fiber was provided by a local CATV company. 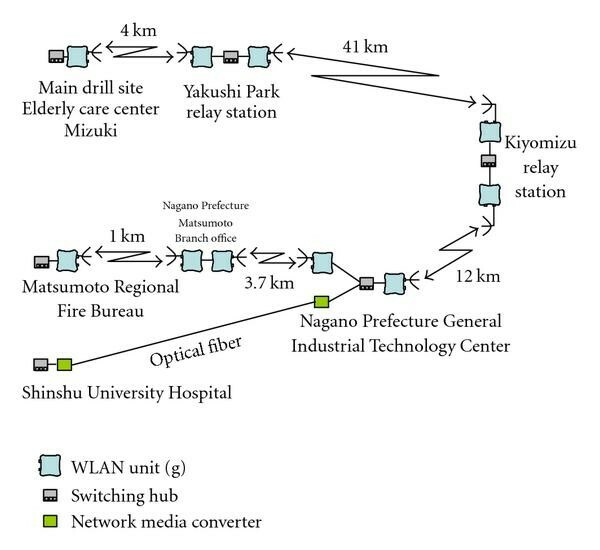 Figure 8 shows a high-quality live video image transmission network from the main drill site to Shinshu University Hospital and the Matsumoto Regional Fire Bureau. Live video image transmission network. This network consists of three systems. The first is the main wireless LAN network aforementioned in Figure 7 to provide network connections. The second is a portable live video transmission system for use in the main drill site. The third is a compact helicopter live video transmission system to send video images of the drill site. The portable live video transmission system is to send detailed information of the devastated areas and patients' medical conditions. The compact helicopter live video transmission system is for giving the overview of the devastated areas for doctors and the fire office. We developed this portable live video transmission system using IEEE802.11b wireless LAN units aforementioned. Firefighters are able to send high-quality live video images and sound from anywhere in the main drill site area by walking with a video camera. This system has a capability of transmitting video images and stereo sound with quality almost as high as TV broadcasting. We also developed this compact helicopter live video transmission system using the same IEEE802.11b wireless LAN units. This system also can send high-quality live video images and sound taken from inside a helicopter to the ground. Figure 9 is a schematic of this live video transmission network focusing on encode and decode of video and audio signals. Block diagram of video encode and decode. The live video images and sounds sent from the portable video-transmission system are received at the base station in the main drill site, and are then sent to the Yakushi Park relay station. Yakushi Park relay station then forwards these packets to the Kiyomizu relay station. In Kiyomizu relay station, the received video image and sound packets are forwarded to the NPGITC. At NPGITC, these image and sound packets are decoded to video and sound signals and these signals are encoded and resent to the Matsumoto Regional Fire Bureau and Shinshu University Hospital at the same time. Meanwhile, live video images and sounds sent from the helicopter are received at Yakushi Park relay station. These image and sound packets are decoded to video signal and sound signals, and displayed. Then these signals are encoded again to be sent to the main drill site, Matsumoto Regional Fire Bureau, and Shinshu University Hospital. Two different encoders are used at Yakushi Park relay station to send live video images to two different directions, the main drill site, and Matsumoto Regional Fire Bureau or Shinshu University Hospital. At the main drill site, live video images sent from a firefighter and a helicopter can be seen at the same time. At Nagano Prefecture General Industrial Technology Center (NPGITC), live video images and sounds sent from the main drill site and the helicopter are decoded to video and sound signals. These two types of signals are encoded by three encoders and sent to Matsumoto Regional Fire Bureau and Shinshu University Hospital. Two encoders are used for Shinshu University Hospital in order that live video images sent from the main drill site and the helicopter can be seen at the same time. The third encoder is for Matsumoto Regional Fire Bureau, which has 2 video and stereo audio interfaces. 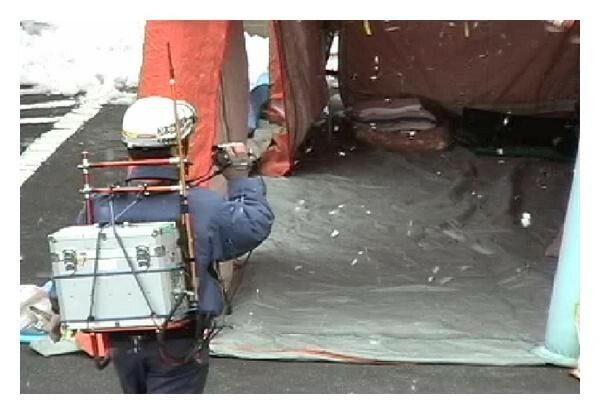 At Matsumoto Regional Fire Bureau, either live video images sent from the main drill site or the helicopter can be seen. This selection is done by changing input interface of the encoder at NPGITC remotely from Matsumoto Regional Fire Bureau. 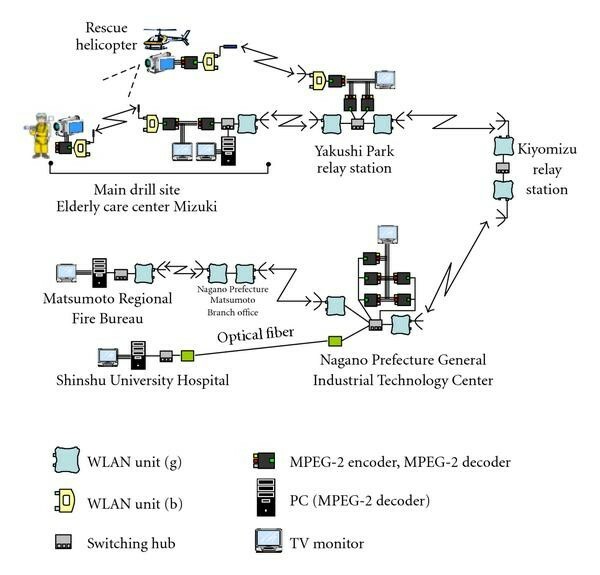 As shown in Figure 9, to transmit live video and audio signals from the main drill site to Shinshu University Hospital, three pairs of encoders and decoders were used. All encoders and decoders used in each system encode and decode MPEG-2 video and sound streams. Figure 10(a) shows the encoder and decoder units we mainly used in this drill. MPEG-2 encoder and decoder: (a) encoder, decoder unit, (b) camcorder with encoder. These encoders and decoders have the same shape. By changing the software to be installed, these units can be either an encoder or a decoder. This unit has video and sound interface as shown in Figure 10(b). sound frequency: 20 Hz-20000 Hz. The first item in (4) (a)–(f) shows compression rate for video signal. CBR and VBR stand for constant bit rate and variable bit rate, respectively. SIF stands for source input format. HalfD1 stands for video size of 352 × 480 pixels for one frame. FullD1 stands for 720 × 480 pixels for one frame. 30 Hz means the frame rate of 30 frames per second. The last item means sound compression rate and monophonic sound or stereophonic sounds. Item (4)-(f) is a standard compression format for standard NTSC broadcasting. NTSC video signals and stereo sounds from a camcorder are directly inputted into this encoder and a decoder unit can output NTSC video and stereo sound signals directly to a TV monitor. 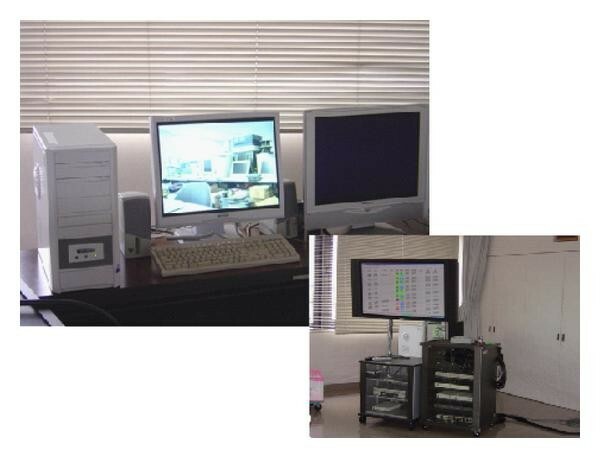 At the main drill site, Matsumoto Regional Fire Bureau, and Shinshu University Hospital, personal computers are used to decode MPEG-2 compressed video signals created by the encoder aforementioned. These personal computers also have a direct connection to a TV monitor. We conducted transmission experiments in advance to see video quality differences versus compression rates. A result showed that there was no big difference in quality between (4)-(c) and (4)-(f). The major difference is the latency of video and sound signal. Item (4)-(c) has about a 0.5 second between an encoder and a decoder. On the contrary, item (4)-(f) has almost no delay. This unit was found to have very high video quality at high compression rates. Taking this result into account, we decided to use (4)-(c) compression format in this drill. 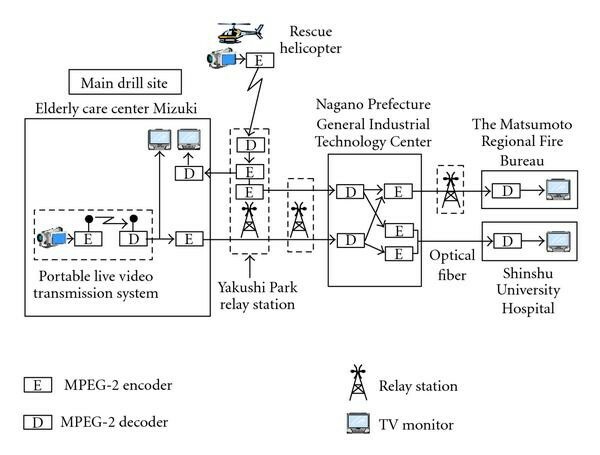 As a result, transmission rates between Yakushi Park relay station and NPGITC should be more than 4 Mbps when two video streams from the main drill site and the helicopter flow at the same time. The distance between the main drill site and Yakushi Park relay station requires the same transmission rate. An IEEE802.11b wireless LAN unit cannot achieve this transmission rate. That is one of the reasons why we developed IEEE802.11g wireless LAN units. On the optical network between NPGITC and Shinshu University Hospital, a compression format of (4)-(f) is used. Therefore, there is almost no delay in video and sound transmission. Figure 11 shows the portable live video transmission system. Figure 11(a) is a video receiver and Figure 11(b) is a video transmitter. 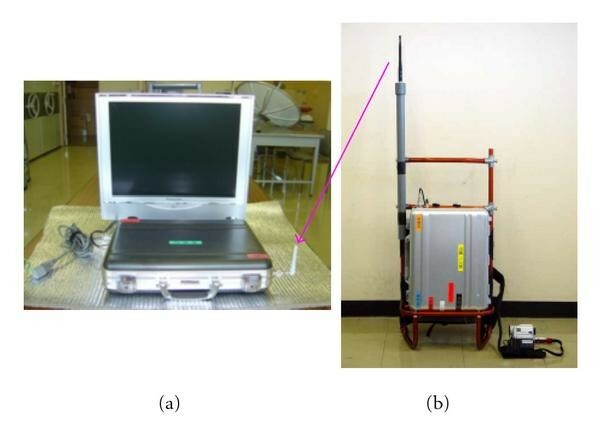 A portable live video transmission system: (a) video receiver, (b) video transmitter. The transmitter provides direct connection to a camcorder. The receiver also provides direct connection to a TV monitor. This system uses MPEG-2 as video-compression formats and IEEE802.11b wireless LAN unit for wireless transmission of MPEG-2 compressed video and sound packets. The MPEG-2 compression rate is 2 Mbps as in (4)-(c). This transmitter can operate for about 3 hours with an internal battery, and weighs about 5 kg. The coverage of this system is about 200 m on the condition that it is in line of sight using 2.14 dBi dipole antennas at the transmitter and the receiver. Figure 12: shows the compact helicopter live video transmission system. Figure 12(a) is a video transmitter for use in a helicopter. Figure 12(b)shows a video receiver for use on the ground. A compact helicopter live video transmission system: (a) a video transmitter, (b) a video receiver. It has almost the same configuration as the portable live video transmission system. The difference is that the video transmitter has a special antenna with a shape of a gun, and that a cable connecting between the antenna and the case, a wireless LAN unit inside the case, and so forth are covered with electromagnetic field shielding fabrics. These fabrics reduce the emission of radio waves and prevent all instruments on the helicopter from malfunctioning by unwanted radio waves. This system can transfer MPEG-2 compressed video signals and sounds using an IEEE802.11b wireless LAN unit. The video compression rate selected is 2 Mbps. With this gun-type antenna with a gain of about 17 dBi and a 24 dBi grid parabolic antenna, the coverage is more than 20 km. This transmitter can operate for about 3 hours with an internal battery, and weighs about 5 kg as well. 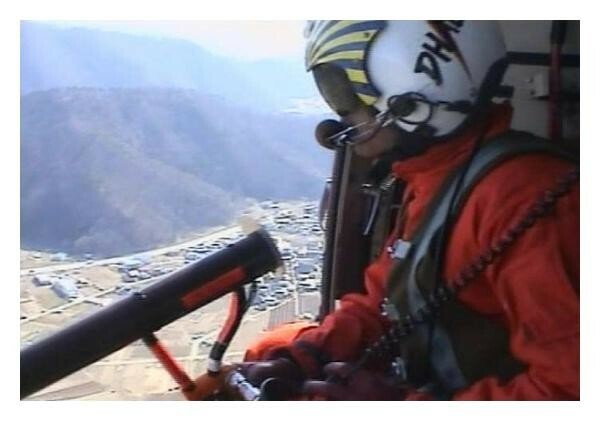 Figure 13 shows a member of Nagano Air Rescue team in a helicopter sending live video images using the gun-type antenna. A member of a rescue team in a helicopter. 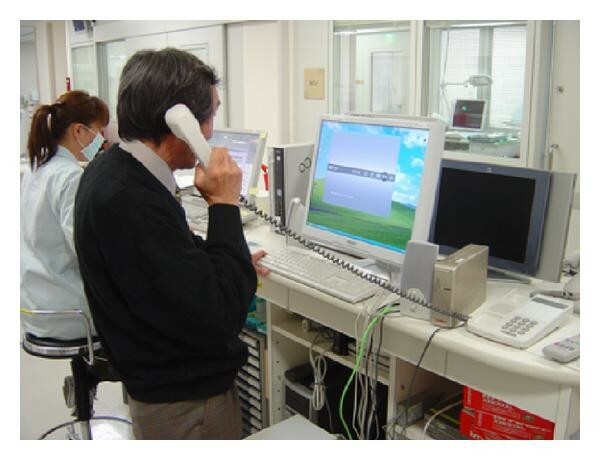 To enable doctors at Shinshu University Hospital and officials at the Matsumoto Regional Fire Bureau to guide paramedics at the main drill site, we used an IP telephony system or voice over IP system (VoIP). VoIP unit and a telephone set. interface: Ethernet 10Base-T; 1 port, telephone; 4 ports. This VoIP unit does not require neither session initial protocol (SIP) server nor private branch exchange (PBX) to put into operation. 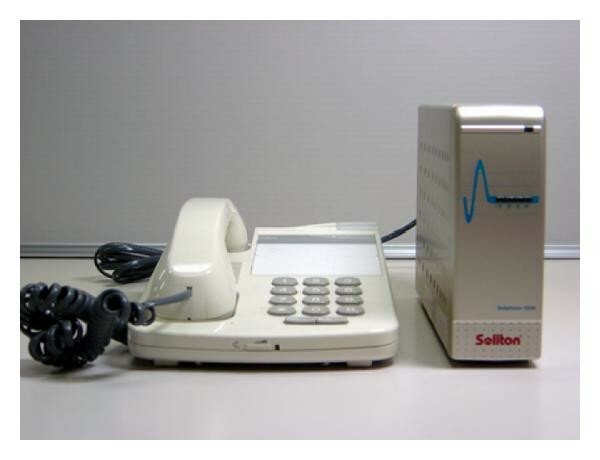 As a result, setting up IP telephony system using this unit is very easy. It can be done by just connecting to the network hub. We used PCM (64 kbps) codec which has a better sound quality than G.729ab (8 kbps) codec, even though PCM required much more transmission bandwidth. Figure 15 shows IP telephony system we set up on this wireless LAN network. As is mentioned above, the SIP server and the PBX are not used in this network. A number after # stands for a phone number. We set up each VoIP unit to have a single-digit speed-dial number. With this system, doctors and officials can call paramedics and talk with them by just speed dialling a phone number. Cordless phones were used at the main drill sites to enable firefighters to communicate with doctors at the hospital, while still being able to remain mobile. Images from Figure 16 to Figure 21 show equipment used for the main drill site, each relay station, NPGITC, the Matsumoto Regional Fire Bureau, and Shinshu University Hospital. 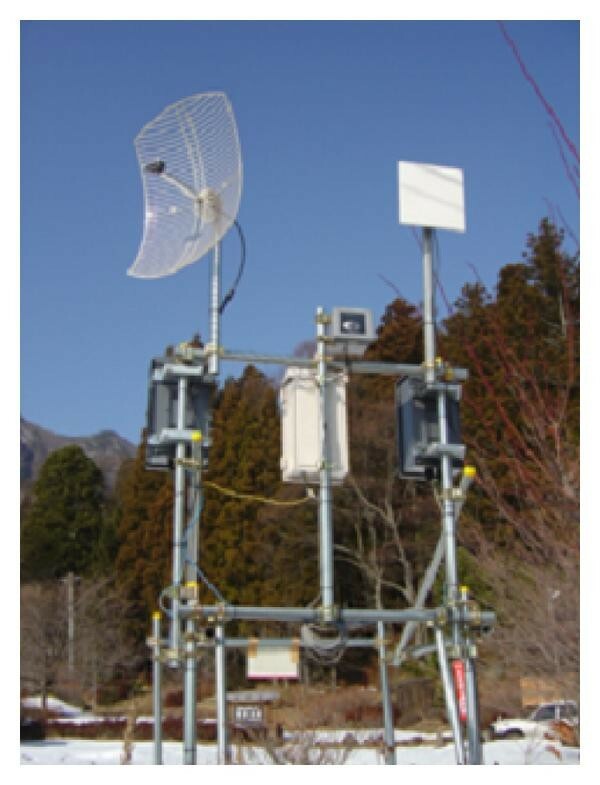 Equipment at the main drill site: (a) wireless LAN unit and its antenna; (b) video monitors for a decoder for the portable live video transmitter, a compact helicopter live video transmission system, and an encoder for Shinshu University Hospital and Matsumoto Regional Fire Bureau. At the main drill site and the Mizuki relay station, flat panel antennas were used, since the distance between these two places is only about 4 km (Figures 16 and 17). Between the Mizuki relay station and the Kiyomizu relay station, 24 dBi grid parabolic antennas were used (see Figures 17 and 18). Grid parabolic antennas with a gain of 24 dBi were also used between the Kiyomizu relay station and NPGITC (see Figures 18 and 19). Nagano Prefecture General Industrial Technology Center (NPGITC). 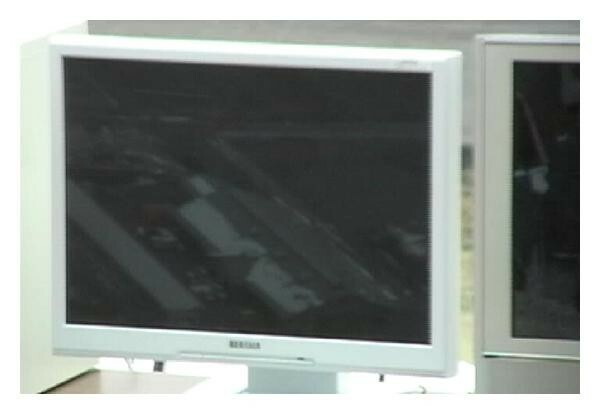 At the Matsumoto Regional Fire Bureau, MPEG-2 compressed video image data were decoded by personal computer and displayed with a flat panel display (Figure 20). A VoIP unit is not shown in Figure 20, but it was used. At Shinshu University Hospital, the MPEG-2 decoder used with a personal computer and VoIP unit to give medical instructions to paramedics were used (Figure 21). Prior to this drill, we conducted two measurements on the maximum transmission rates. The first was to measure maximum transmission rate in an ideal environment, in which there were no interferences. This measurement configuration is shown in Figure 22. Two wireless LAN units are connected to each other via a fixed attenuator and a variable attenuator. To measure the maximum transmission rate, software called "Iperf" was used. This software can measure the maximum transmission of a network. This software was installed onto 2 different personal computers. One of these computers was to be set up to run as an Iperf server and the other one was set up to run as Iperf client. The maximum transmission rate was measured for 30 seconds. Measurement results showed that the maximum transmission rates on average were 20.2 Mbps. An actual maximum transmission rate measurement in the open air was also conducted in advance. In this measurement, two wireless LAN units were placed at a distance of about 45 km in line of sight. Each wireless LAN unit used a grid parabolic antenna with a gain of 24 dBi as shown in Figure 4. The measured maximum transmission rate was 6.6 Mbps and the maximum transmission rate on average in 30 seconds was 4.6 Mbps. Figure 23 shows a firefighter at the main drill site who is sending video images by the portable video transmission system. A video image example taken and sent by this system is shown in Figure 24. The portable live video transmission system. Transmitted image example of emergency treatment drill with dummy. The distance between the base station and the portable video transmitter was about 50 m. The received picture had quality almost as good as TV broadcasting images. Figure 25 shows an example of the image received at the main drill site transmitted by the portable video transmission system. Received video image example from the portable live video transmission system at the main drill site. These images had high quality and were received without problems, such as stoppage for short periods in video transmission. Figure 26 shows an example of the image received at the main drill site transmitted by the compact helicopter live video transmission system. Received video image example from the compact helicopter live video transmission system at the main drill. These images had higher quality than a professional system, which uses spectrum of 15 GHz licensed only for disaster-related organizations in Japan. This system transmits video signals using analog modulation technology. Figures 27 and 28 show video images received over our network at Shinshu University Hospital. An emergency-treatment doctor is watching and giving instructions to paramedics using IP telephony system in Figure 27. This picture shows the received image quality is almost equal to TV broadcasting pictures. 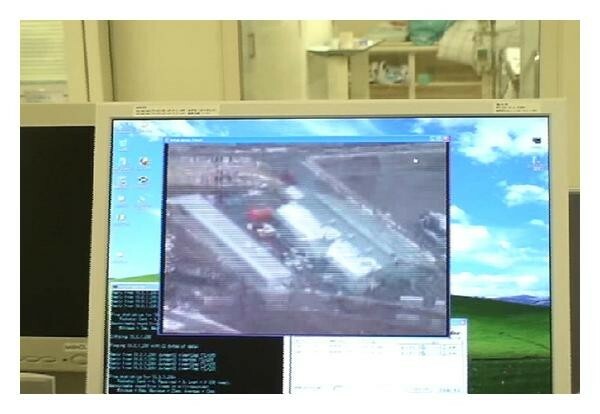 A received video image example at Shinshu University Hospital sent from the main drill site. 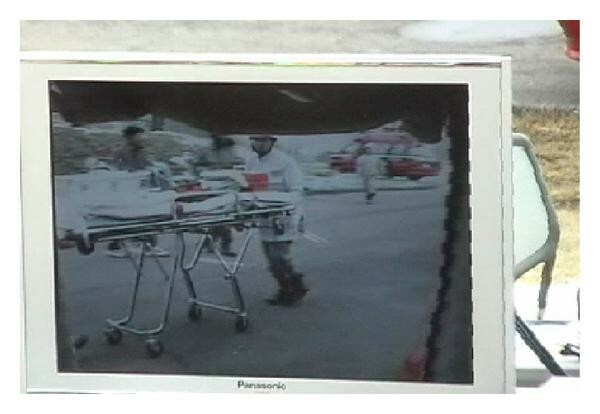 A received video image example at Shinshu University Hospital sent from the rescue helicopter. This system has about a one-second delay in the video image viewing between the drill site and Shinshu University Hospital, because of the compression and decompression delay of the video encoder and decoder. Figure 28 shows a video image taken and sent from the rescue helicopter. This system can give clear live views of the devastated area. Kiyomizu relay station and NPGITC: 54 Mbps. An IP telephony system was able to be operated with this video transmission system at the same time and gave clear sound quality to both the paramedics and the doctor. The setup of all makeshift relay stations can be completed and operational in about 2 hours, thus giving our network an extremely fast deploy time anywhere in the world. Live video images obtained at Shinshu University Hospital have extremely exceptional quality as found in today's broadcasting fields. This enables doctors to check patients' complexion and health condition. This live video image transmission is likely to cut about 1 hour off the time at which a surgery starts after a patient is transported from this drill site to Shinshu University Hospital, whereas without it, it could take up to 3 hours to start surgery. About a one-second delay of video and sound occurs, due to encoding and decoding of video images 3 times. The reason why the link speed between Mizuki relay station and Kiyomizu relay station was 36 Mbps is that antennas with a gain of 24 dBi were used. This wireless LAN unit has been designed to be used with an antenna with a gain of 26.5 dBi in order to achieve a wireless connection of 30 km at a transmission rate of 54 Mbps. We have developed IEEE802.11g complied wireless LAN units and conducted experiments to confirm the capability of these units in an earthquake drill organized by a regional fire bureau. Features of this drill were to send high-quality video images and sound of areas struck by a large-scale and strong earthquake to hospitals, and to give instructions to paramedics by doctors, using a makeshift wireless LAN network made up of these LAN units. In this drill, a portable live video transmission system and a compact helicopter live video transmission system we developed were also used successfully in the main drill site area. These systems consisted of IEEE802.11b wireless LAN units we had already developed. The networks that we established and successfully operated consisted of only IEEE802.11b/g wireless LAN units. The experiment conducted in the drill shows that developed wireless LAN units have a capability of transmitting data 41 km with a link speed of 36 Mbps using 24 dBi parabolic antennas. This distance established a record as the longest distance MPEG-2 compressed video and audio information has been transmitted over a wireless LAN network in Japan. We succeeded in transmitting MPEG-2 compressed video images at 2 Mbps over the temporally wireless LAN network we established for this drill. Images were successfully sent from a portable live video transmission system and a compact helicopter transmission system to Shinshu University Hospital. MPEG-2 compressed images, sent at 2 Mbps using the encoder and decoder we used, have a high quality enough for use in diagnosing patient conditions. VoIP telephony system we used is easy to set up and can give clear sound quality. This system is very helpful in establishing communication where any type of telephone system is knocked out of service. The earthquake drill conducted shows that live video images transferred over this wireless LAN network have enough quality for use in telemedicine in emergency treatment. Use of a helicopter video feed, we believe, would enable emergency personnel including doctors to better assess a situation. This could help with decisions relating to the amounts of aid needed, time factors in dangerous circumstances, and where best to locate rescue crews. We believe that our portable units would be an asset in any emergency situation, anywhere in the world. Our wireless LAN units are easy to set up, operate, and maintain, and are able to transmit real-time images of a disaster area. These units would be a great benefit for emergency units and disaster-relief organizations in that they would open up great opportunities to put aid where it is needed most. This paper is a part of the project of the development of long-range, high-speed wireless LAN to establish an emergency network for the disaster prevention and the postdisaster communications supported by the Fire and Disaster Management Agency of Japan (FDMA). The authors wish to give their thanks to FDMA.